I’ve found the secret to fruit salad. And I don’t think I’m ever going to make another fruit salad recipe ever again. This one is the business. Guys. I have a strawberry addiction. The strawberries are SO good right now. Like, so so good. I am buying an exorbitant amount each week. I’ve made enough recipes to share over the next few weeks while my kitchen is being renovated, and it wasn’t until I really looked at all of the recipes that I realized that I made FIVE recipes with strawberries. I hope you’re hungry for strawberries. This recipe comes from Robyn’s new book, Add a Pinch. First of all? This book is GORGEOUS. Everyone who has walked by it in our home has asked “what book is this?! It’s so pretty!” It really is. Second, the recipes are approachable but sound so.dang.good. The next on my list if the white chicken enchilada stuffed shells. Eeeep. Oh my gosh. I actually turned down the corner for about 15 different recipes in the book. 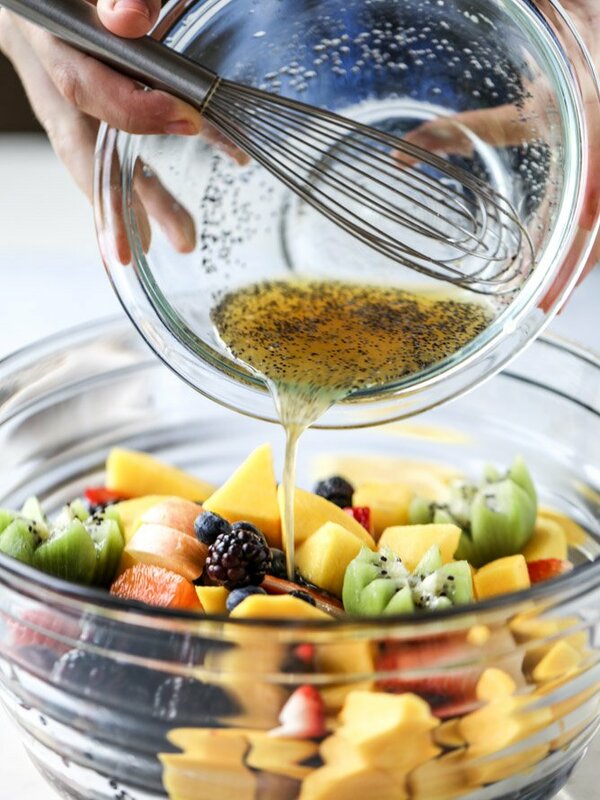 While I would normally think that fruit salad is a cop out choice to share here on the blog, I was really intrigued by the dressing and also thought it was the perfect Easter side dish! The funny thing is that – the components of the dressing? The ginger and the lemon juice and the poppy seeds? They aren’t something that I’d go crazy over and really decide to actively put on my fruit. I was hesitant to even taste the salad after we made it. BUT then. Oh my gosh. One bite and I was seriously hooked. This dressing is absolutely incredible. I could not stop eating the fruit salad. Eddie was eating the fruit salad over the sink straight from the bowl after he ate five fajitas because it was so good. (Also probably because he gave up sweets for Lent and hasn’t cheated at all.) Max gobbled up the fruit salad up like a crazy person. The flavor is spot on. My favorite thing of all though is that you can use whatever the heck fruit that you want to use. There are really no guidelines here, aside from the dressing recipe. Which we’ve already established is to die for. I mean, I could drink the stuff. I also think it’s worth mentioning that the fruit doesn’t swim in the dressing. It’s the perfect amount to coat a few cups of fruit and give them this zing of “oh my gosh what IS that?” flavor. You know? I could practically even consider this dessert, which is huuuuge. 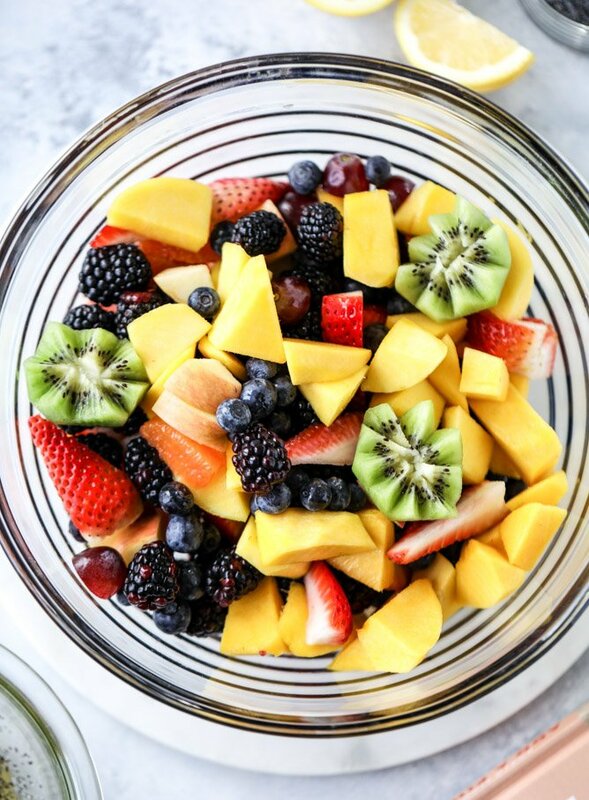 Place the fruit in a large bowl. 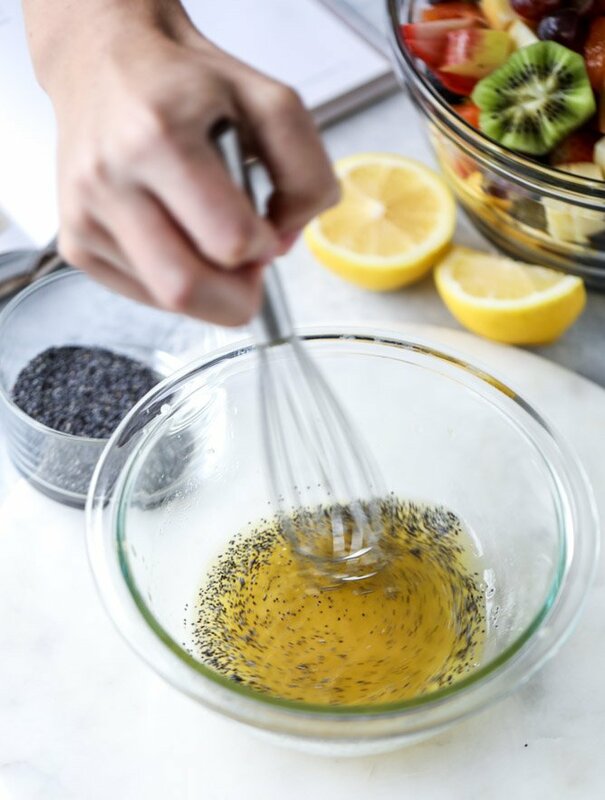 Whisk together the juices, sugar, poppy seeds and ginger until combined. Pour it over the fruit and toss well. I like to throw in a few mint leaves and use it to garnish as well – totally optional! Maaaaybe just a little scoop of ice cream on top. Love those kiwi flowers! I need to work on that. “What do you eat” to have so good ideas?! Poppy seeds. Very good idea. About strawberries I am agree with previous comment ” eating too many strawberries” impossible. This time was not possiblity to freeze berries. So, we eat as much we could ( and I could a lot) and others were made for jam. 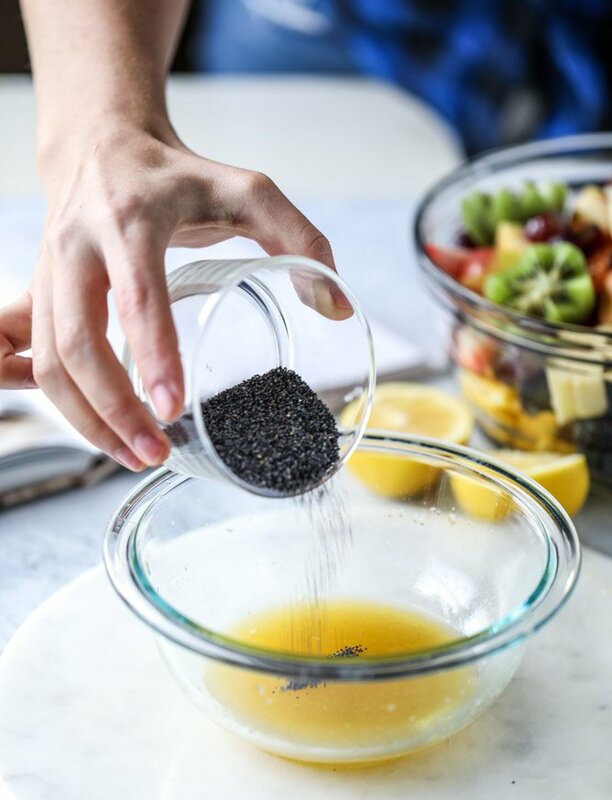 Poppy seed fruit salad is full of flavors, Looks so good, Delicious in taste. Its not only tasty but also a healthy salad. I liked it so much. Thank you for sharing its recipe!!! usually I mix a bunch of fruit sans dressing and call it a day. but this one sounds so easy and the ginger and mint sound so zingy, that i’ll have to whip it up next time i get my hands on a flat of strawberries ? So refreshing! This looks delicious! Looks amazing! How did you get the kiwi to look like a flower? I really do not do fruit salad….at all. Maybe it’s because everyone adds banana, which I think looks gross and also I just despise banana. But this dressing sounds delicious and interesting, and you make it look so pretty! I love throwing nouns after the phrase “whatever the heck.” It makes me laugh ?. Anyway, you are #killingit ! I live in strawberry land (Ventura County, CA)! There are fields of them everywhere as well as all of the corresponding farm stands! It’s so great to be able to pick up flats of them (usually around $10) and feast on berries that came off the fields just a bit ago. This is such a beautiful salad! 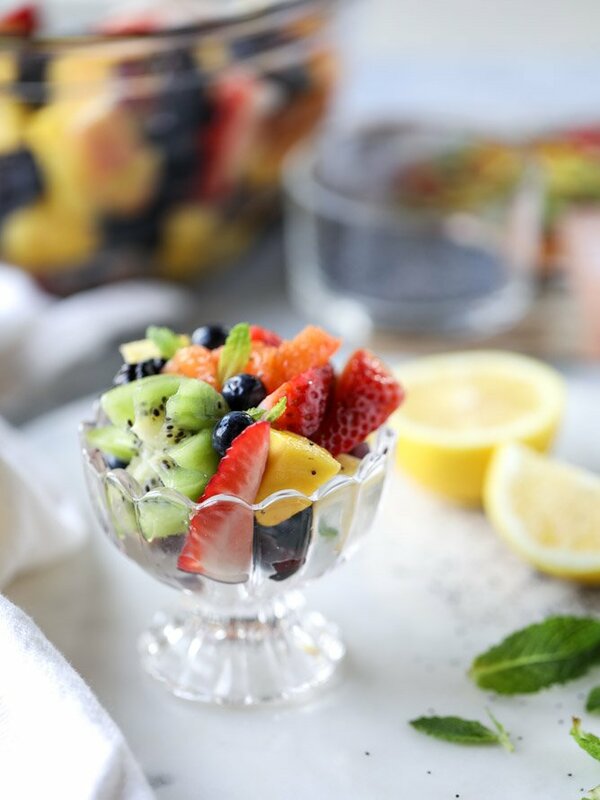 What a fun way to dress up fruit salad! I love this idea! Love the cut on the kiwi — visually stunning! Made this over the weekend for my family’s Easter celebration and it was a huge hit! Definitely going in my permanent recipe file. I made this for Easter dinner. It was beyond delicious! 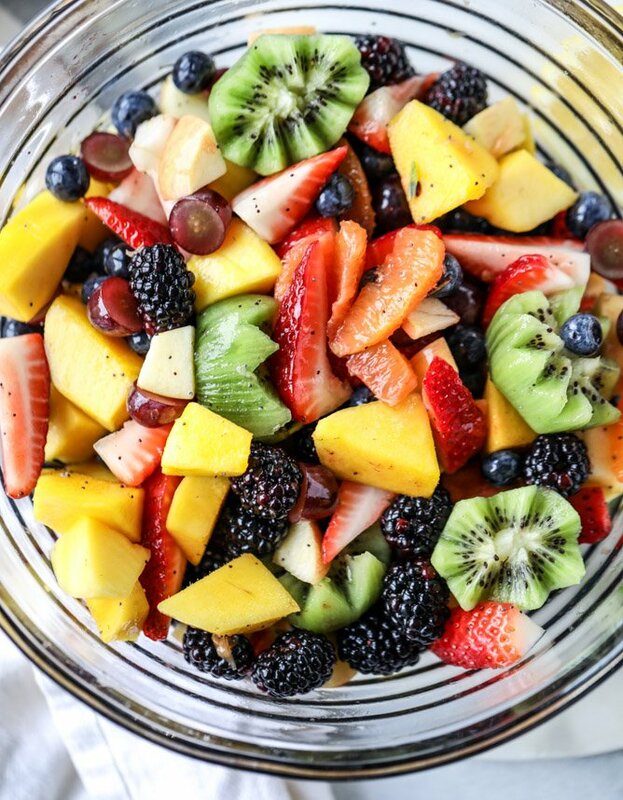 All other fruit salad recipes may now just go away. Forever. where she removes the kiwi skin either before or after cutting. This is SO good! It’s hot-hot in AZ and this recipe was a wonderful addition to our Memorial Day BBQ. 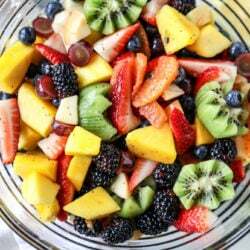 It is fresh tasting and the dressing enhances the natural flavor of the fruit without masking it. It’s not overly sweet and the mint adds to the freshness. I LOVE the mint. LOVE IT!!! Pingback: PrettySalads: Recipes for all kinds of Salads like Pasta Salads, Chicken Salads and more. This recipe is the perfect example of tasty and healthy food salad. Ultimate recipe! Thanks for sharing!